Like a lot of other folks, we wanted fresh eggs and help with the gardening. We knew we couldn't have roosters because we live in a neighborhood, and it would seriously bug the neighbors. 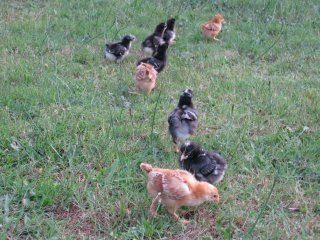 We decided to get them locally, and what was available in the breeds we wanted was straight run chicks. My husband wanted 1 Rhode Island Red, 1 Black Australorp, and 1 Barred Plymouth Rock... so we got THREE of each chick in the hopes that we would have at least one girl from each breed. Now it is seven weeks later, the chicks are between 7-8 weeks, and we have 3 girls... one of each breed. Luckily, a really nice lady from our local Freecycle group was happy to take all 6 roosters once she heard they got along fine in the same pen. Turns our she and her kids just like having animals follow them around at home, and she's had up to 20 pet roosters at a time on her property. My husband was crushed, and said he felt like he had lost a friend. 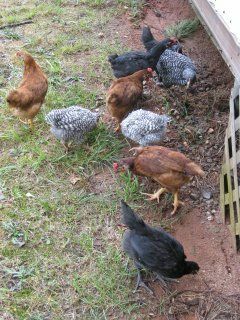 Our favorite chickens in the flock were the two Barred Rock roos. They perched, falcon-like, on my wrist and followed me around the yard. Up until I was loading them in the dog crate to take to Lisa (the wonderful rooster-keeping lady), he kept asking if I was SURE they were roosters until I told him I was 100% sure they were roosters and would be EXTREMELY surprised if they turned out to be hens. He was hoping we'd have 6 hens and was planning a permanent coop instead of the eglu he bought for us to move around the yard. But... who knows? All of the breeds he picked lay light-medium brown eggs, and I'd really like to add some other colors to our eggs. It'd be nice to add a really dark brown egg layer and an Ameraucana/Easter Egger or two for blue-greens. So if the hens and I can persuade him to build a coop and really big run, maybe we can get another crop of chicks this next Spring, keep our 3 favorite girls, and integrate the 2 small flocks into one flock when the chicks have fully grown.